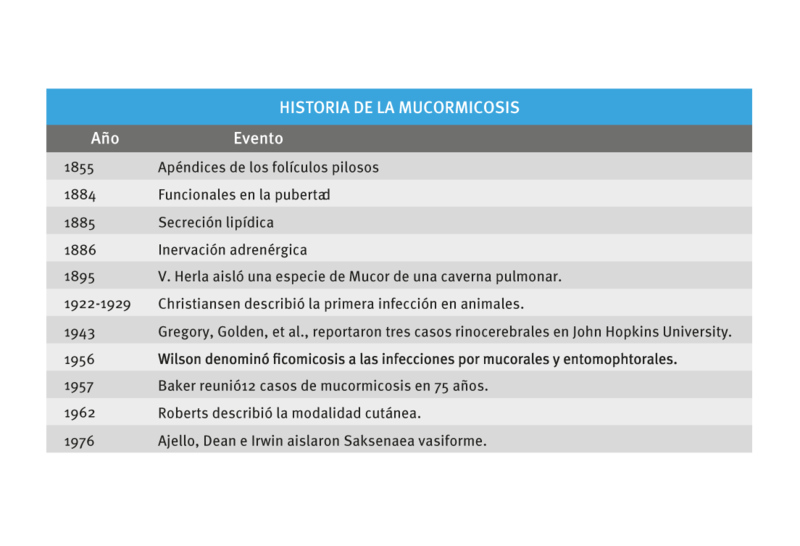 La mucormicosis es una micosis oportunista y poco frecuente, producida por hongos Zygomicetos del orden Mucorales, asociada con inmunosupresión y de curso agresivo y mortal. 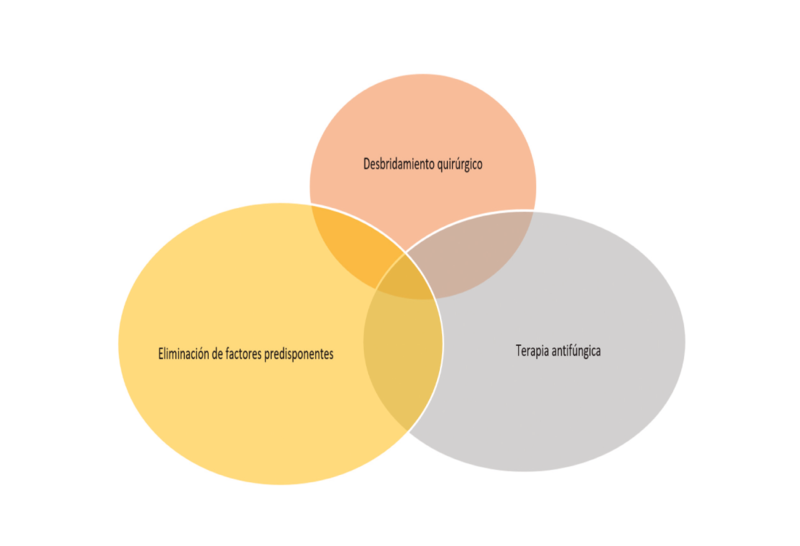 Puede dividirse en varios tipos, según el lugar de infección, en rinocerebral (por extensión desde la rinofaringe o por diseminación hematógena), cutánea (más habitualmente en pacientes con diabetes mellitus descompensada, leucemia o cáncer) y pulmonar, entre otras. Generalmente, se adquiere por vía respiratoria ya que las esporas de los hongos se encuentran en el ambiente, aunque en las formas cutáneas primarias, la infección se adquiere por solución de continuidad. El diagnóstico se confirma con un estudio completo de hongos (examen directo y cultivo para hongos en agar Sabouraud). El estudio anatomo-patológico, aunque permite visualizar perfectamente a los agentes fúngicos, por su demora, no es el método diagnóstico de elección. Una vez hecho el diagnóstico, se debe iniciar un tratamiento temprano, oportuno y adecuado, identificar los factores predisponentes y corregirlos de manera oportuna, ya que esta entidad tiene una alta tasa de mortalidad. Se utiliza la anfotericina B como tratamiento de elección que se mantiene hasta estabilizar al paciente y, en las variedades rinocerebrales o pulmonares, se requiere la eliminación quirúrgica del material necrótico. Algunos autores recomiendan el uso de azoles para estas infecciones, sin embargo, el consenso general es que el mejor tratamiento sigue siendo la anfotericina B y los otros antifúngicos están reservados para casos especiales. Mucormycosis is an opportunistic mycosis, uncommonly produced by Zygomycetes fungi of the orderMucorales, associated with immunosuppression, of an aggressive and fatal course. It can be divided into several types, depending on the site of infection, such as rhinocerebral (by extension from the rhinopharynx or by hematogenous dissemination), cutaneous (more commonly in patients with decompensated diabetes mellitus, leukemia or cancer) and pulmonary, among others. It is generally acquired by the respiratory route since the spores of fungi are found in the environment, although in the primary cutaneous forms, infection is acquired by solution of continuity. The diagnosis is confirmed by a complete mycological study (direct examination and culture for fungi in Sabouraud agar). The anatomo-pathological study, although it allows visualizing perfectly the mycotic agents, due to its delay is not the method of choice. Once the diagnosis has been made, an early, adequate and appropriate management should be initiated, the predisposing factors identified and corrected promptly, since this entity has a high mortality rate. Amphotericin B is used as the treatment of choice, which is maintained until the patient is stabilized, and surgical removal of the necrotic material is required in the rhinocerebral or pulmonary varieties. Some authors recommend the use of azoles for these infections, however, in general consensus is that the best treatment is still amphotericin B and the other antifungal drugs are reserved for special cases. Figura 2. Examen directo con hidróxido de potasio (KOH) en el que se visualizan filamentos hialinos de bordes irregulares, largos y anchos, y con escasos tabiques. Figura 3. Examen directo del cultivo con azul de lactofenol en el que se observan filamentos muy gruesos, sin tabiques (cenocíticos), con estructuras asexuadas de reproducción (esporangióforo, esporangio y esporangiosporas). 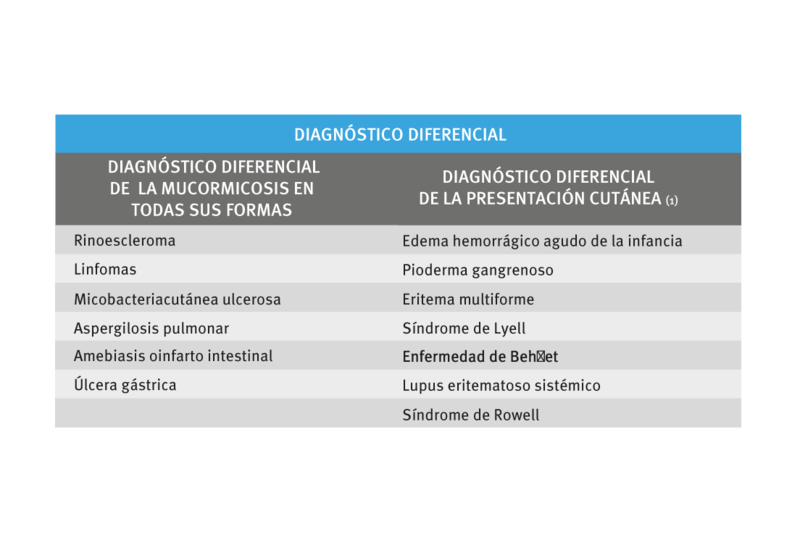 renas R. Micología médica ilustrada. Cuarta edición. México, D.F. : Editorial McGraw Hill; 2011. p. 251-68. Cox G. Mucormycosis (zygomycosis). Uptodate. 2015;1-19. Kwon-Chung KJ. 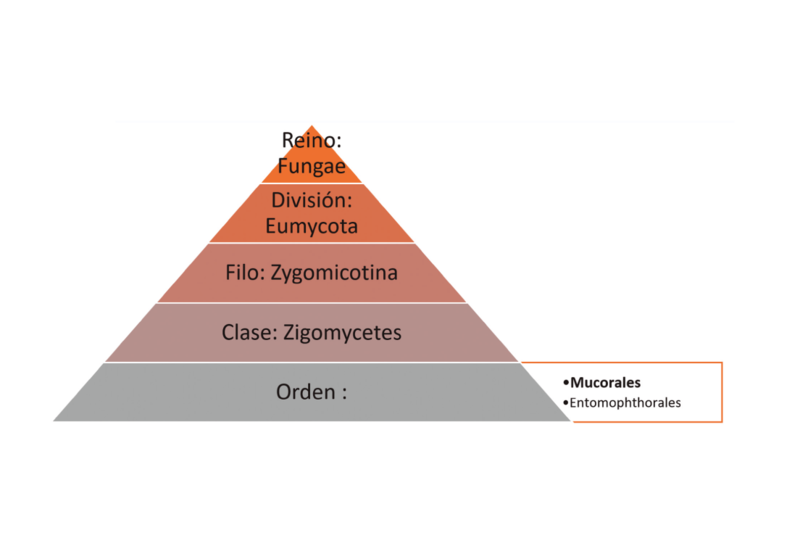 Taxonomy of fungi causing mucormycosis and entomophthoramycosis (zygomycosis) and nomenclature of the disease: Molecular mycologic perspectives. Clin Infect Dis. 2012;54(Suppl.1):S8-15. Roden MM, Zaoutis TE, Buchanan WL, Knudsen TA, Sarkisova TA, Schaufele RL, et al. Epidemiology and outcome of zygomycosis: A review of 929 reported cases. Clin Infect Dis. 2005;41:634-53. Binder U, Maurer E, Lass-Flörl C. Mucormycosis--from the pathogens to the disease. Clin Microbiol Infect. 2014;20(Suppl.6):60-6. Auberger J, Lass-Florl C, Aigner M, Clausen J, Gastl G, Nachbaur D. Invasive fungal breakthrough infections, fungal colonization and emergence of resistant strains in high-risk patients receiving antifungal prophylaxis with posaconazole: Real-life data from a single-centre institutional retrospective observational study. J Antimicrob Chemother. 2012;67:2268-73. Lalwani S, Govindasamy M, Gupta M, Siraj F, Varma V, Mehta N, et al. Gastrointestinal mucormicosis – four cases with different risk factors, involving different anatomical sites. Indian J Gastroenterol. 2012;31:139-43. Ma LJ, Ibrahim AS, Skory C, Grabherr MG, Burger G, Butler M, et al. 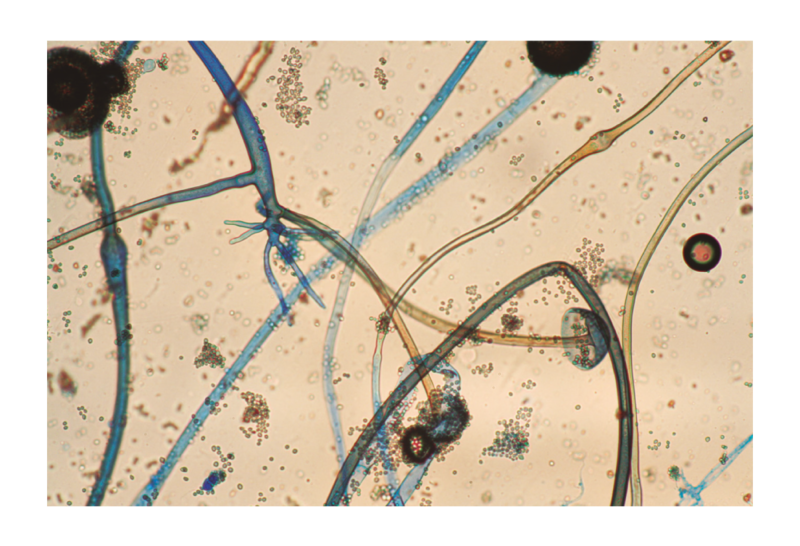 Genomic analysis of the basal lineage fungus Rhizopus oryzae reveals a whole genome duplication. PLoS Genet. 2009;5:1-11. Morace G, Borghi E. Invasive mold infections: Virulence and pathogenesis of mucorales. Int J Microbiol. 2012;2012;1-5. Symeonidis AS. The role of iron and iron chelators in zygomycosis. Clin Microbiol Infect. 2009;15(Suppl.5):26-32. Ibrahim AS, Spellberg B, Avanessian V, Fu Y, Edwards JE Jr. Rhizopus oryzae adheres to, is phagocytosed by and damages endothelial cells in vitro. Infect Immun. 2005;73:778-83. Mingfu L, Spellberg B, Phan QT, Fu Y, Fu Y, Lee AS, et al. The endothelial cell receptor GRP78 is required for mucormycosis pathogenesis in diabetic mice. J Clin Invest. 2010;120:1914-24. Levitz SM, Selsted ME, Ganz T, Lehrer RI, Diamond RD. In vitro killing of spores and hyphae of Aspergillus fumigatus and Rhizopus oryzae by rabbit neutrophil cationic peptides and bronchoalveolar macrophages. J Infect Dis. 1986;154:483-9. Netea MG, Ferwerda G, van der Graaf CA, van der Meer JW, Kullberg BJ. Recognition of fungal pathogens by toll-like receptors. Curr Pharm Des. 2006;12:4195-201. Netea MG, van der Meer JW, Kullberg BJ. Role of the dual interaction of fungal pathogens with pattern recognition receptors in the activation and modulation of host defense. Clin Microbiol Infect. 2006;12:404-9. Chamilos G, Lewis RE, Lamaris G, Walsh TJ, Kontoyiannis DP. Zygomycetes hyphae trigger an early, robust pro-inflammatory response in human polymorphonuclear neutrophils through toll-like receptor 2 induction but display relative resistance to oxidative damage. Antimicrob Agents Chemother. 2008;52:722-4.
van de Veerdonk FL, Kullberg BJ, van der Meer JW, Gow NA, Netea MG. Host-microbe interactions: Innate pattern recognition of fungal pathogens. Curr Opin Microbiol. 2008;11:305-12. Warris A, Netea MG, Verweij PE, Gaustad P, Kullberg BJ, Weemaes CM, Abrahamsen TG. Cytokine responses and regulation of interferon-gamma release by human mononuclear cells to Aspergillus fumigatus and other filamentous fungi. Med Mycol. 2005;43:613-21. Lewis RE, Kontoyiannis DP. Epidemiology and treatment of mucormycosis. Future Microbiol. 2013;8:1163-75. Spellberg B, Edwards J, Jr, Ibrahim A. Novel perspectives on mucormycosis: Pathophysiology, presentation, and management. Clin Microbiol Rev. 2005;18:556-69. Geramizadeh B, Modjalal M, Nabai S, Banani S, Abbas F, Hamidreza F, et al. Gastrointestinal zygomycosis: A report of three cases. Mycopathologia. 2007;164:35-8. Kontoyiannis DP, Wessel VC, Bodey GP, Rolston KV. Zygomycosis in the 1990s in a tertiary-care cancer center. Clin Infect Dis. 2000;30:851-6. Kauffman CA, Malani AN. Zygomycosis: An emerging fungal infection with new options for management. Curr Infect Dis Rep. 2007;9:435-40. Kontoyiannis DP, Lionakis MS, Lewis RE, Chamilos G, Healy M, Perego C, et al. Zygomycosis in a tertiary-care cancer center in the era of Aspergillus-active antifungal therapy: A case-control observational study of 27 recent cases. J Infect Dis. 2005;191:1350-60. Trifilio SM, Bennett CL, Yarnold PR, McKoy JM, Parada J, Mehta J, et al. Breakthrough zygomycosis after voriconazole administration among patients with hematologic malignancies who receive hematopoietic stem-cell transplants or intensive chemotherapy. Bone Marrow Transplant. 2007;39:425-9. Lanternier F, Sun HY, Ribaud P, Singh N, Kontoyiannis DP, Lortholary O. Mucormycosis in organ and stem cell transplant recipients. Clin Infect Dis. 2012;54:1629-32. Almyroudis NG, Sutton DA, Linden P, Rinaldi MG, Fung J, Kusne S. Zygomycosis in solid organ transplant recipients in a tertiary transplant center and review of the literature. Am J Transplant. 2006;6:2365-74. Aslani J, Eizadi M, Kardavani B, Khoddami-Vishteh HR, Nemati E, Hoseini SM, Einollahi B. Mucormycosis after kidney transplantations: Report of seven cases. Scand J Infect Dis. 2007;39:703-6. Singh N, Aguado JM, Bonatti H, Forrest G, Gupta KL, Safdar N, et al. Zygomycosis in solid organ transplant recipients: A prospective, matched case-control study to assess risks for disease and outcome. J Infect Dis. 2009;200:1002-11. Ibrahim AS, Spellberg B, Edwards J, Jr. Iron acquisition: A novel perspective on mucormycosis pathogenesis and treatment. Curr Opin Infect Dis. 2008;21:620-5. Maertens J, Demuynck H, Verbeken EK, Zachée P, Verhoef GE, Vandenberghe P, Boogaerts MA. Mucormycosis in allogeneic bone marrow transplant recipients: Report of five cases and review of the role of iron overload in the pathogenesis. Bone Marrow Transplant. 1999;24:307-12. Lanternier F, Dannaoui E, Morizot G, Elie C, García-Hermoso D, Huerre M, et al. A global analysis of mucormycosis in France: The RetroZygo Study (2005-2007). Clin Infect Dis. 2012;54(Suppl.1):35-43. Andresen D, Donaldson A, Choo L, Knox A, Klaassen M, Ursic C, et al. Multifocal cutaneous mucormycosis complicating polymicrobial wound infections in a tsunami survivor from Sri Lanka. Lancet. 2005;365:876-8. Kouadio IK, Aljunid S, Kamigaki T, Hammad K, Oshitani H. Infectious diseases following natural disasters: Prevention and control measures. Expert Rev Anti Infect Ther. 2012;10:95-104. Neblett-Fanfair R, Benedict K, Bos J, Bennett SD, Lo YC, Adebanjo T, et al. Necrotizing cutaneous mucormycosis after a tornado in Joplin, Missouri, in 2011. N Engl J Med. 2012;367:2214-25. Kurosawa M, Yonezumi M, Hashino S, Tanaka J, Nishio M, Kaneda M, et alet al. Epidemiology and treatment outcome of invasive fungal infections in patients with hematological malignancies. Int J Hematol. 2012;96:748-57. Marty FM, Cosimi LA, Baden LR. Breakthrough zygomycosis after voriconazole treatment in recipients of hematopoietic stem-cell transplants. N Engl J Med. 2004;350:950-2. Oren I. Breakthrough zygomycosis during empirical voriconazole therapy in febrile patients with neutropenia. Clin Infect Dis. 2005;40:770-1. Gale GR, Welch AM. Studies of opportunistic fungi. 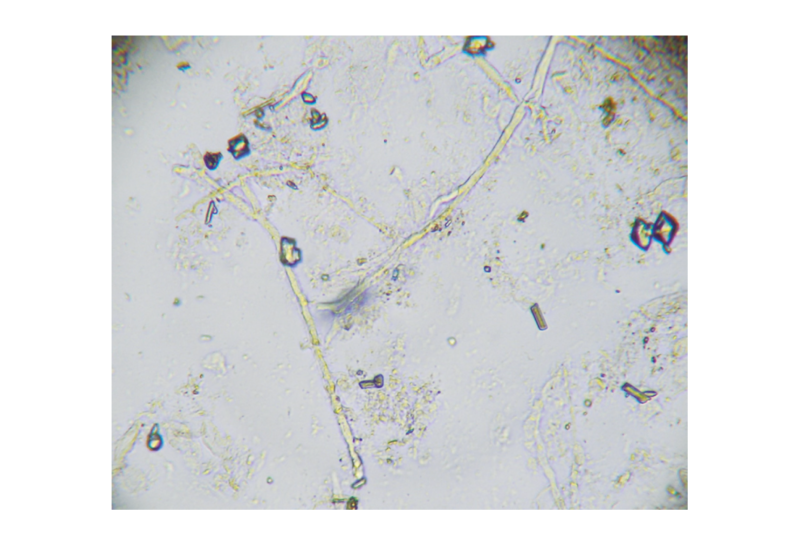 I. Inhibition of Rhizopus oryzae by human serum. Am J Med Sci. 1961;241:604-12. Teixeira CA, Medeiros PB, Leushner P, Almeida F. Rhinocerebral mucormycosis: Literature review a propôs of a rare entity. BMJ Case Rep. 2013:2013:1-3. Rajagopalan S. Serious infections in elderly patients with diabetes mellitus. Clin Infect Dis. 2005;40:990-6. Tedder M, Spratt JA, Anstadt MP, Hegde SS, Tedder SD, Lowe JE. Pulmonary mucormycosis: Results of medical and surgical therapy. Ann Thorac Surg. 1994;57:1044-50. Brown RB, Johnson JH, Kessinger JM, Sealy WC. Bronchovascular mucormycosis in the diabetic: An urgent surgical problem. Ann Thorac Surg. 1992;53:854-5. Murphy RA, Miller WT, Jr. Pulmonary mucormycosis. Semin Roentgenol. 1996;31:83-7. Chamilos G, Marom EM, Lewis RE, Lionakis MS, Kontoyiannis DP. Predictors of pulmonary zygomycosis versus invasive pulmonary aspergillosis in patients with cancer. Clin Infect Dis. 2005;41:60-6. Adam RD, Hunter G, DiTomasso J, Comerci G, Jr. Mucormycosis: Emerging prominence of cutaneous infections. Clin Infect Dis. 1994;19:67-76. Warkentien T, Rodríguez C, Lloyd B, Wells J, Weintrob A, Dunne JR, et al. Invasive mold infections following combat related injuries. Clin Infect Dis. 2012;55:1441-9. Chakrabarti A, Kumar P, Padhye AA, Chatha L, Singh SK, Das A, et al. Primary cutaneous zygomycosis due to Saksenaea vasiformis and Apophysomyces elegans. Clin Infect Dis. 1997;24:580-3. Weinberg WG, Wade BH, Cierny G 3rd, Stacy D, Rinaldi MG. Invasive infection due to Apophysomyces elegans in immunocompetent hosts. Clin Infect Dis. 1993;17:881-4. Arnáiz-García ME, Alonso-Peña D, González-Vela MC, García-Palomo JD, Sanz-Giménez-Rico JR, Arnáiz-García AM.Cutaneous mucormycosis: Report of five cases and review of the literature. J Plast Reconstr Aesthet Surg. 2009;62:434-41. Geisen M, Fodor P, Eich G, Zollinger A, Dzemali O, Blumenthal S. Disseminated cutaneous mucormycosis in a patient on high-dose steroid therapy for severe ARDS. Intensive Care Med. 2011;37:1895-6. Ismail MH, Hodkinson HJ, Setzen G, Sofianos C, Hale MJ. Gastric mucormycosis. Trop Gastroenterol. 1990;11:103-5. Oliver MR, van Voorhis WC, Boeckh M, Mattson D, Bowden RA. Hepatic mucormycosis in a bone marrow transplant recipient who ingested naturopathic medicine. Clin Infect Dis. 1996;22:521-4. Agha FP, Lee HH, Boland CR, Bradley SF. Mucormycoma of the colon: Early diagnosis and successful management. AJR Am J Roentgenol. 1985;145:739-41. Prasad N, Ram R, Satti Reddy V, Dakshinamurty KV. Nonfatal gastric mucormycosis in a renal transplant recipient. South Med J. 1997;90:341-4. Hosseini M, Lee J. Gastrointestinal mucormycosis mimicking ischemic colitis in a patient with systemic lupus erythematosus. Am J Gastroenterol. 1998;93:1360-2. Levy E, Bia MJ. Isolated renal mucormycosis: Case report and review. J Am Soc Nephrol. 1995;5:2014-9. Nagy-Agren SE, Chu P, Smith GJ, Waskin HA, Altice FL. Zygomycosis (mucormycosis) and HIV infection: Report of three cases and review. J Acquir Immune Defic Syndr Hum Retrovirol. 1995;10:441-9. Weng DE, Wilson WH, Little R, Walsh TJ. Successful medical management of isolated renal zygomycosis: Case report and review. Clin Infect Dis. 1998;26:601-5. Langston C, Roberts DA, Porter GA, Bennett WM. Renal phycomycosis. J Urol. 1973;109:941-4. Tedder M, Spratt JA, Anstadt MP, Hegde SS, Tedder SD, Lowe JE. Pulmonary mucormycosis: Results of medical and surgical therapy. Ann Thorac Surg. 1994;57:1044-50. Brown RB, Johnson JH, Kessinger JM, Sealy WC. Bronchovascular mucormycosis in the diabetic: An urgent surgical problem. Ann Thorac Surg. 1992;53:854-5. González CE, Couriel DR, Walsh TJ. Disseminated zygomycosis in a neutropenic patient: Successful treatment with amphotericin B lipid complex and granulocyte colony-stimulating factor. Clin Infect Dis. 1997;24:192-6. Chamilos G, Lewis RE, Kontoyiannis DP. Delaying amphotericin B-based frontline therapy significantly increases mortality among patients with hematologic malignancy who have zygomycosis. Clin Infect Dis.2008;47:503-9. Noxafil (posaconazole). Highlights of prescribing information. Fecha de consulta: 18 de marzo de 2014. Disponible en:https://www.merck.com/product/usa/pi_circulars/n/noxafil/noxafil_pi.pdf.